THIS JUST HAPPENED – Yesterday, I was sitting at my gate in Charlotte waiting to board my flight home to DC on American Airlines and it’s packed. Walking towards me was an African American woman and my parents raised me to consider others more than myself so I offered to get up so she could have my seat. She said “no thank you sweetheart” and she elected to sit next to me and we talked for 20 min before boarding. Then we small talked about life and the conversation went to the Lord. She mentioned Chuck Colson (who I told her I met at his 75th birthday party) and she was surprised and this led to another discussion. Next thing I know she says, “I’m the woman who was in prison when Kim Kardashian recently went to the Oval Office on my behalf and President Trump had me released.” Wow!! For nearly 22 years she was incarcerated and God used Kim and POTUS to help grant her freedom. Her 75,000 word book will hit bookstores soon and she told me the title but I promised not to reveal the book’s name but it will be powerful. It was a Divine Appointment and the Bible says, “be kind to strangers because some have entertained angels unaware.” I’m so glad I was willing to be kind and reach out to her. God was all over her. As I got off the plane at Reagan I smiled because this huge poster of her was welcoming her to the city of my birth. 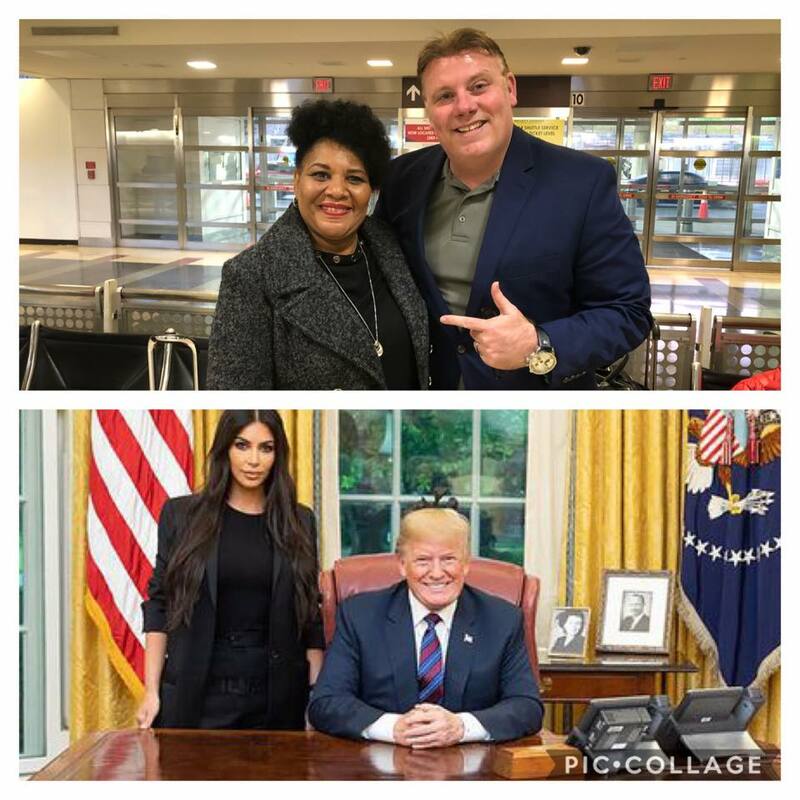 We exchanged business cards and I told her I had a burden for Hollywood and would love to lead a Bible study to some of the “stars” and Kim has been on my prayer list for several years. The Lord is our advocate, counselor and Judge who paid our price and exchanged His grace for our guilt and granted FREEDOM because of His forgiveness. The Bible says, “there is one Mediator between God and man” and it’s not Mohammed, Buddha or organized religion but JESUS, The Christ.